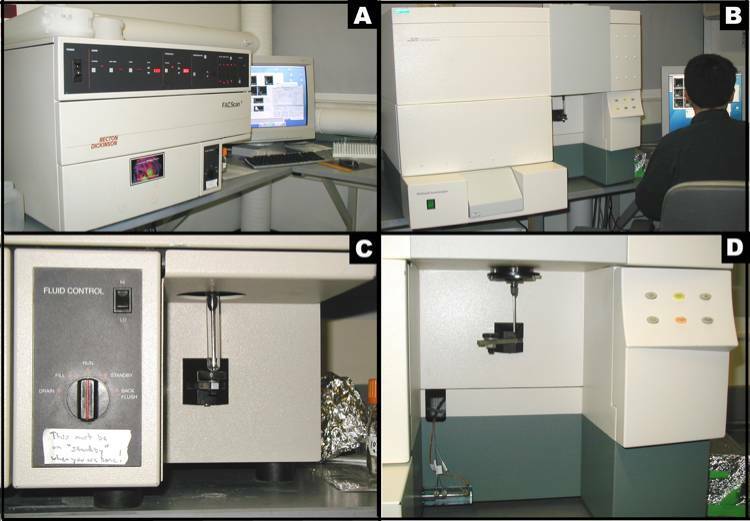 Flow cytometers: Beckton Dickinson (BD) FACScan (BD Biosciences, San Jose, CA) with 5-color upgrade (Cytek Development, Fremont, CA) in Figures A and C, or FACSCalibur (BD Biosciences, San Jose, CA) in Figures B and D below. Figure A: Becton Dickinson FACScan setup. Figure B: Becton Dickinson FACSCalibur setup. Figure C: BD FACScan sample port. Figure D: BD FACSCalibur sample port. Mice are obtained at 8 and 16 wks of age (BD +/- 3 days) from production rooms, see Jaxpheno2_Protocol, Workflow step 8 and Procedure: d.
a. Mice are weighed and bled for hematology (see Jaxpheno4), then immediately euthanized using CO2 asphyxiation or cervical dislocation. b. Immediately after euthanasia mice are prepared for dissection and spleen removal and weighed using a Mettler-Toledo analytical balance. c. A small midsection of the spleen is placed in a fresh Eppendorf tube with PBL FACS buffer and stored on ice until analyzed via Flow Cytometry. a. Spleen fragments from each mouse are gently mashed in 1 to 2 mL FACS Buffer and filtered through 70µm nytex nylon mesh. a. Chilled cell suspensions (50µL) are aliquoted into 11x75mm polypropylene (USA Scientific 1450-0000FC) or polystyrene (BD Biosciences 352008) tubes. b. All antibodies are titrated to determine optimal staining levels with minimum background staining. c. Diluted antibody cocktail (10µL) is added to each pre-labeled tube. d. Cells are stained for 30 min at 4°C. e. Cells are washed with 2mL of FACS Buffer and centrifuged at 500xg for 5 min. f. Supernatants are decanted and cells re-suspended in the residual buffer left in the tubes. g. 200µL additional FACS Buffer is added to each tube followed by 10µL of a 20µg/mL Propidium iodide solution for dead cell exclusion. a. Samples are acquired on a BD FACScan (with Cytek 5 color upgrade) cytometer (see Figure A and C above) or BD FACSCalibur (see Figures B and D above) and at least 20,000 live events are collected according to manufacturer's protocol. Cautionary Note: The specified monoclonal antibody clones used in this study have not been tested on all strains. It is possible the antibodies do not recognize all isotypes of the marker. Thus low cell numbers for a population might not be a good reflection of the actual count. a. Acquired cell count files are analyzed with FlowJo software (Treestar.com). b. 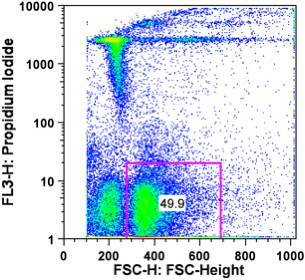 Viable cells are gated by forward scatter (FSC) and exclusion of propidium iodide as shown below. c. Red blood cells are also excluded as they have lower FSC than lymphocytes. d. T cells are gated from the viable cell gate on the basis of CD3 and CD4 expression for CD4+ T cells ("T helper"), and CD3 and CD8 expression for CD8+ T cells ("cytotoxic"). e. NKT cells are gated as CD3+/dull and NKG2D+. f. NK cells are gated as NKG2D+ and CD3-. Note that NKG2D is not a particularly bright antigen, thus it is not always easy to identify these cells. This marker does appear to be coexpressed on NK1.1+ cells in those strains that express NK1.1. g. B cells are gated from the viable cells as positive for the CD45R/B220 antigen. h. A gate containing monocytes and granulocytes is made which is CD11b+ and B220-; thus, monocytes are gated as CD11b mid to high and Gr-1 low to negative, and granulocytes are gated as CD11b high and Gr-1 high. i. The percentage of each population of viable cells is reported. Note: the percent of viable cells of total is not the same as % cell viability, as the total includes red cells and debris in addition to dead cells. Of the 20,000 viable cells (live events) counted: number and % of B cells, numbers and % of granulocytes and monocytes, numbers and % of CD4 T, CD8 T, NKT, and NK cells.